As anyone who lives in the North East knows, a few days ago the weather was unbearably hot and humid. Very unusual for May and, to tell you the truth, it was making me a bit crabby. With the hot breath of the sun bearing down on us for so long the boys and I decided to see if our favorite neighbor had opened their pool, but no luck. It was still sealed up tight, with a thick layer of leaves to top it off. Discouraged, we headed back home, grumbling and moaning, until we remembered our favorite weekday watering hole. That is not to say our favorite drinking location, but our best dipping pool and trout sanctuary. We turned the truck around and headed the few miles down the road to Kent Falls. 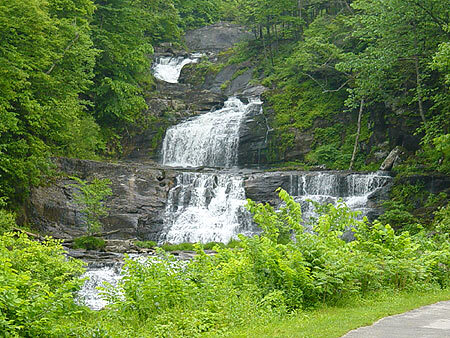 Kent Falls is a State Park in northern Kent that in the summer is a very popular picnic spot. In fact it is the most visited State Park in Connecticut, due in part to the fact that it is so very accessible. It is right off the state road and has lots of parking, a stream and a wide open field for picnicking. It’s greatest attraction, however, is an incredibly beautiful series of waterfalls that drop steeply into delectably clear pools perfect for bathing. The water is cold, sparkling and divine. There are stairs beside the falls that lead up to the top, with a wire fence that declares in multiple places along the route in very clear language “NO SWIMMING”. Swimming is permitted, although not legally sanctioned, in the two pools nearest the bottom, and on the average summer weekend day the pool is filled to overflowing with frolicking children and their parents splashing around in the cold water. This is usually not a problem for us, as we almost never go on the weekends. From Memorial Day to Labor Day the park charges a fee to enter on Saturday and Sunday, so we typically stick to afternoons during the week. On some occasions, though, we have arrived at the park to find the pool occupied with swimmers, and while my children aren’t averse to swimming, they are first and foremost fishermen. Kent Falls is not a swimming hole but a designated trout park dedicated to fishermen like my boys, so say the park rules. This become a problem for us when we have come to fish and others want to swim. We are usually in the minority. For many years I have counseled the boys about the necessity to work together with others and to compromise, but how do you explain to a child that they can’t do what they want because others are breaking the rules. How do you explain that if LOTS of people are breaking the rules, than they have the priority? It doesn’t seem right. But then again, if you had driven 2 hours to see the falls, and your children were frolicking in the water with a dozen others, and two boys came with rods and told everyone to clear out because they wanted to fish and the law was on their side, how would you feel? It is a delicate situation and one we try to avoid. 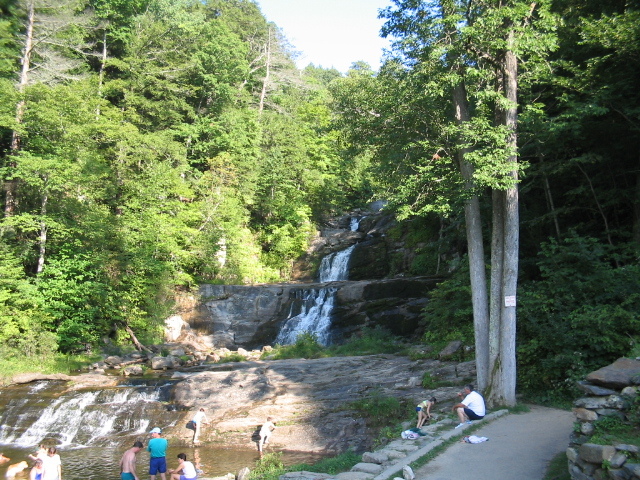 Regardless of that ethical dilemma, when we arrived at the Falls that day, no one was in the pool, and I got to swim in the wonderfully cold water and lower my temperature and irritability level at the same time while the boys caught minnows in the stream to use as bait. While I knit in the shade, they proceeded to catch several beautiful trout in a matter of minutes. We kept three, all about 13″, thanking them for their lives and cleaning them in the bushes. Below you will find how I prepared them. After cleaning the trout, salt the inside flesh to taste. Wrap each trout in tinfoil and set the grill to medium low. Place each trout on the grill and cook for about 6 minutes a side. Meanwhile slice onion in half and into thin strips. Saute the onions in olive oil until sort and beginning to brown. 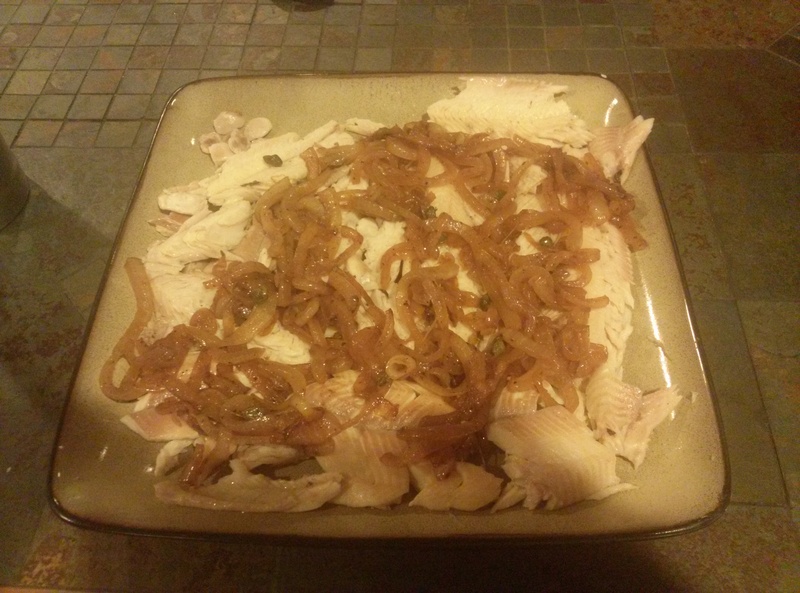 Squeeze the lemon onto the onions, add the white wine and the capers and saute until the liquid has evaporated. Salt and pepper to taste. Remove the trout from the grill and open the tinfoil packets. With a fork gently lift off the skin of the trout and remove the flesh from the bones. The flesh should be flaky. Place on a platter and top with the onions. Serve and enjoy! Don’t forget the cheeks; some say they are the best part of the meal. After cooking, lift the skin just past the end of the jaw and scoop out the tasty buttons. They are there in the photo – in the far left corner of the platter.